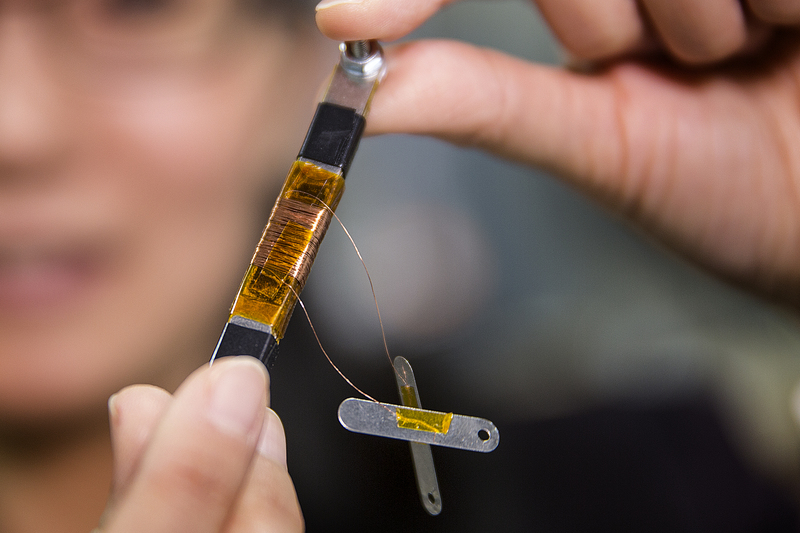 Liyan Qu, assistant professor of electrical and computer engineering, recently earned a five-year, $500,000 Faculty Early Career Development Program Award from the National Science Foundation to develop a next-generation power grid transformer. As solar panels and wind turbines proliferate, integrating these new energy sources into the nation’s power grid brings increasing challenges. A UNL engineer’s research is helping to create a new smart grid to enable a future of renewable energy. Liyan Qu, assistant professor of electrical and computer engineering, recently earned a five-year, $500,000 Faculty Early Career Development Program Award from the National Science Foundation to develop a next-generation power grid transformer. These prestigious grants, known as CAREER awards, support pre-tenure faculty who exemplify the role of teachers-scholars through outstanding research, excellent education and the integration of education and research. Today’s power grid uses transformers to increase and decrease grid voltages as required for electricity generation, delivery and consumption. They are designed to handle the relatively steady stream of power from fossil fuel-based plants and have limited capability to manage fluctuations. However, electricity generated from renewable sources, such as wind generators, isn’t constant, requiring a more advanced transformer to control the variable voltage. Qu is developing a device made of a new composite material that will continuously control transformer voltage output, making transformers more flexible, improving renewable energy integration and helping to minimize energy losses. Transformers work by taking advantage of the magnetic field around an electric circuit. The incoming current flows through wires wrapped around a magnetic core, generating a magnetic flux. That flux, in turn, induces a voltage in a second set of coiled wires. Transformers alter the outgoing voltage level, but have a limited ability to adapt to variable incoming sources of energy. Qu’s new device is able to continuously and rapidly adjust the magnetic flux to provide a steady and controllable outgoing voltage, she said. The magnetoelectric device consists of layers of metglas, a metal alloy with magnetic properties, and PZT, a metal oxide with the unique property of changing structure when an electric field is applied. The structural distortion alters the magnetization of the metglas layers. Qu is investigating how to better manipulate the device’s ability to control transformer voltage. “Because this is so new, we need to study the working principles and develop appropriate models to see how we can control and operate this new device,” Qu said. 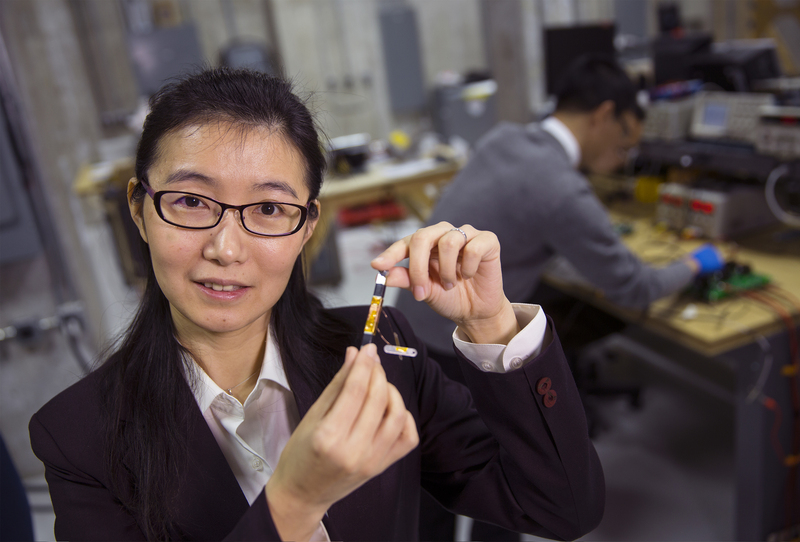 She and her colleagues will also design and test a prototype of an adjustable voltage transformer using the new device. In addition to power grids, the device also could improve other applications that use transformer technology, such as electric appliances, devices and motors. Qu is working with NUtech Ventures, UNL’s technology commercialization affiliate, to commercialize her technologies. The CAREER award allows Qu to expand UNL’s electric power and energy systems curriculum. In addition to creating new courses, she’ll incorporate undergraduate students into electric power research in partnership with Nebraska utility companies. She’ll also engage K-12 students through several community programs to promote STEM education and electric power research, particularly among women and minority students, groups traditionally underrepresented in STEM fields. “Currently, there are critical demands for training a new generation of professionals and educators to accommodate the fast-changing environment in the electric power and energy industry,” Qu said.